For decorations, feel free pull to out all the stops: velvet over windows and doorways, lace and brocade, gold paper doilies, your finest linens, silver, and china. Print out a picture of each queen (see website links below) and stand it on her table in a pretty frame. Drape each queen’s “throne” with rich fabric or velvet ribbon. Make a sign to put on the seat, held in place by a child’s dress-up crown. Each queen’s sign gives her name, the years she reigned, and the menu for her table, printed in an elegant script font. When Elizabeth ruled, tea was not yet drunk in England, but roses grew by the acre. Sugar was a rare spice. Use doilies to make lacy ruffles around dishes, echoing the ruffled collars worn by men and women of her court. Cheese and onion tarts: For a medieval touch, add nutmeg, cloves, and raisins. Apples in wine sauce & cream: Boil peeled apples slices in red wine spiced with ginger and lemon peel. Serve them on a platter drizzled with warm cream, sweetened with honey. The European rage for tea reached England just as Anne became Queen. All tea came from China in those days, and most of it was green tea, which the English drank with sugar and milk. If you have Queen Anne-style tables or chairs, with graceful curved legs ending in small feet, use them here. Place vivid tulips in a china vase at this table. Classic scones and fruit breads, with butter and cream cheese spreads. 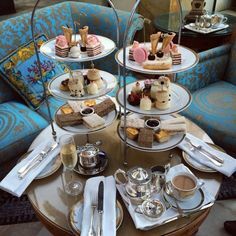 Indian tea came into its own during Victoria’s reign, while afternoon tea became a national institution. 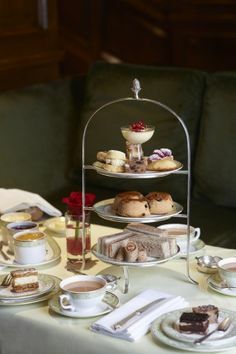 She even had a tea cake named after her: the “Victoria sandwich” or “Victoria sponge.” It consisted of two layers of sponge cake separated by jam or a soft cream filling. Potted flowers were in every parlor in those days, so use them to decorate this queen’s table. Layer flowery handkerchiefs, placemats, old lace runners and new doilies over a tablecloth for a cozy Victorian look. Find her picture at http://worldroots.com/brigitte/gifs/queenelizabeth66.jpg The biggest change in tea during Elizabeth’s reign has been the tea bag revolution. 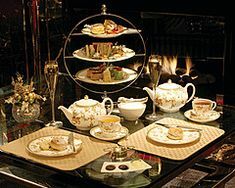 Take advantage of it to offer a variety of flavors and varieties of tea at this queen’s table, displayed on a handsome tray or platter. She rules in a world of readymade delicacies, so use convenience foods to prepare the dishes on her table. 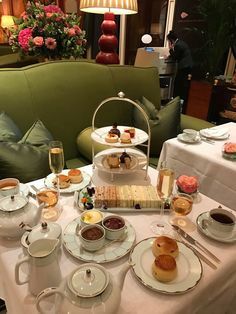 Choose an appropriate tea that will work with each of the tables. 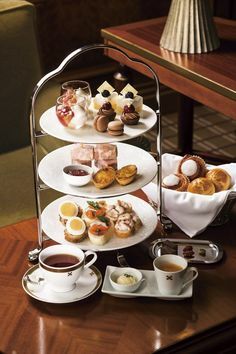 I suggest British Bliss as it is a hearty tea that will work well with nearly all the menus. If you want a dessert tea I suggest trying Dark Chocolate Decadence which will pair well with a fruit tart.